Exchanging rings as a token of your love is a monumental step in your life, and the rings you exchange are bought with the hope of not replacing them for long. Also, the once in a lifetime investment, rings need to be carefully selected. The person wearing them must fee your love in the ring and carry it around with pride. No one wants to go wrong with selecting the ring that might lead to embarrassment to their partner, so here’s a guide for you on how to select the best ring setting for your beloved. 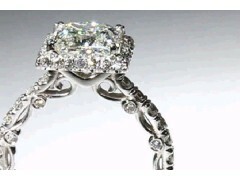 Below are the most preferable engagement ring setting. The first thing to begin with is the diamonds you plan to have in the engagement ring. There are many styles for arranging them. 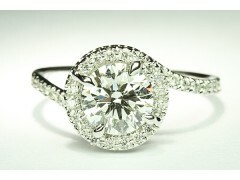 Some prefer a single diamond in the centers, while other may like the three stone setting. Solitaire settings generally include a three stone setting, with one main diamond in the center, and two smaller ones on each side. The one in the center represents the present, while the on either sides represent the past and the future. The center diamond or gemstone is held in place with the help of prongs. Most diamonds are held in place with the help of a four prong setting. Sometime if the diamonds are bigger, they may even come clutched in a six prong setting. The number of prongs needed, will depend on the size of the diamond, and how much security it needs. In case a prong setting is not on the list of the settings you prefer for the center diamonds on the rings, there are a number of alternatives you can try. The most popular among them is the bezel setting. It consists of a metal frame that wraps around the diamond securely. Not only does the setting hold the diamond in place, but also provide it with extra protection against damage. However, the underside of such setting is that it does not allow as much light to pass through the diamonds, and therefore diamonds may not sparkle to their best ability. As a solution to this problem, jewelers have invented what they call the flush setting. It offers equal protection to the diamond, without hampering the amount of light passing refracting through the diamond. The setting is perfect for enhancing the beauty of the diamond, while holding it safely for a long time. In case you chose to have an engagement ring setting with side stone, these tiny tots will also need to have settings. The most common side stone setting is the channel setting or the bar-channel setting. With a channel setting, the diamonds are held in place within a narrow metal channels over the band. The diamonds are lined along this channel, which keeps them highly secure. If we talk about the bar channel setting, it comprises of metal channel even between the each stone, which provides an interesting contrast between the shine of the metal and the sparkle of the diamonds. Besides, another popular side stone setting is the pave setting. If there a large number of tiny diamonds featured on the ring, they are mounted into very small holes drilled into the metal. The small diamonds are placed in these holes, which is a time consuming process, and so adds up to the cost of the rings. For further inquires feel free to contact us.